The ticket booth is handy when it's time to recoup some costs. Constructed of super tough synthetic cedar decking planks, it looks fantastic. It comes with redwood signs denoting the various inflatable toys and their prices with a big yellow "Tickets" sign on top. 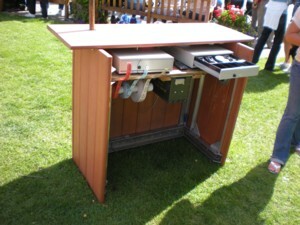 Also included are two cash drawers, a master cash box and several ticket spoolers. If you like we can pad-lock the cash drawers to the booth. Using numbered tickets and the cash drawers is a great way to maintain cash control. 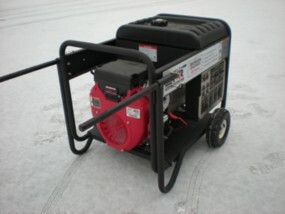 Brand new 20 horse power Honda generator. It puts out 87 amps (10,000 watts) continuously. It is capable of supplying 100% of the power required to run everything we have! It will run all 7 blowers (5 inflatables) and our air compressor with power to spare! With a 10 gallon fuel tank, it will run about 6 hours under a full load. We have a Honda EU2000i if you need smaller generator to run something other than our inflatables that's a quite a distance from the big generator above. It puts out about 10 amps continuously. It's super quiet. We have a small air compressor for blowing up balloons as fast as you can stick them on the nozzle! It has a 25 foot hose. We carry about 15 Coleman folding bag chairs. 10' x 10' EZ Up canopy for shade. Quick set up and it works great over the ticket booth on hot or rainy days. Stakes included.